An artist's conception depicts an immense disk of gas surrounding a massive, bright Wolf-Rayet star (at center). An ongoing act of cosmic cannibalism may be responsible for the strange appearance and unprecedented behavior of a gigantic star nicknamed "Nasty 1," a new study reports. Observations by NASA's Hubble Space Telescope have revealed a disk of gas nearly 3 trillion miles (4.8 trillion kilometers) wide surrounding Nasty 1, which is a massive, rapidly aging object known as a Wolf-Rayet star. For example, some scientists think these massive stars' powerful stellar winds blow away their own hydrogen envelopes. Another idea holds that the outer layers are siphoned off by a cannibalistic companion star. A pancake-shaped disk of gas circles around an extremely bright star nicknamed "Nasty 1," in our Milky Way galaxy. "That's what we think is happening in Nasty 1," study lead author Jon Mauerhan, of the University of California, Berkeley, said in a statement, referring to the second hypothesis. "We think there is a Wolf-Rayet star buried inside the nebula, and we think the nebula is being created by this mass-transfer process. So this type of sloppy stellar cannibalism actually makes Nasty 1 a rather fitting nickname." 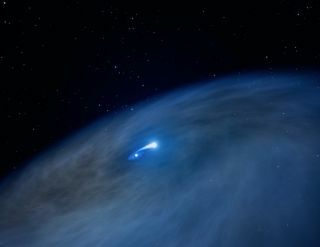 Such a disc had never before been seen surrounding a Wolf-Rayet star, researchers said. The nebula is likely only a few thousand years old and lies about 3,000 light-years from Earth, they added. Several other factors further bolster the cannibalism idea over the stellar-wind hypothesis, study team members said. For one thing, at least 70 percent of all massive stars belong to binary systems. And modeling work suggests that such a star's own winds may not be strong enough to push it to Wolf-Rayet status. "We're finding that it is hard to form all the Wolf-Rayet stars we observe by the traditional wind mechanism, because mass loss isn't as strong as we used to think," co-author Nathan Smith, of the University of Arizona, said in the same statement. "Mass exchange in binary systems seems to be vital to account for Wolf-Rayet stars and the supernovae they make, and catching binary stars in this short-lived phase will help us understand this process," Smith added. It's tough to get a precise bead on Nasty 1, whose nickname is a play off its formal catalog name NaSt1 (the star was discovered in 1963 by Jason Nassau and Charles Stephenson). The star is obscured by a great deal of gas and dust, so Mauerhan and his team were not able to determine the mass of Nasty 1 or its companion, the distance between them or the amount of material the companion is ingesting, researchers said. This image provides a compass and scale for star WR 122 (NaSt1). Image released May 21, 2015. It's also unclear exactly what will happen to Nasty 1 down the road, but the star's evolutionary path "will definitely not be boring," Mauerhan said. "The Wolf-Rayet could explode as a supernova," he added. "A stellar merger is another potential outcome, depending on the orbital evolution of the system. The future could be full of all kinds of exotic possibilities, depending on whether it blows up or how long the mass transfer occurs, and how long it lives after the mass transfer ceases." The new study was published online today (May 21) in the Monthly Notices of the Royal Astronomical Society.